Note: Once submitted, this date cannot be changed. Our records show that more than one device is associated with this mobile number. Please provide the serial number (IMEI) for the device you wish to claim. Unfortunately, the serial number entered does not match our records. Please try again. We've made it fast and easy to start your claim. Login with your My T-Mobile username and password for secure access. Details about your damaged or lost device. What's the make, model, and serial number of the device you're claiming? What happened to it? When did it occur? If a service fee or deductible applies, have your credit card or checking info handy. 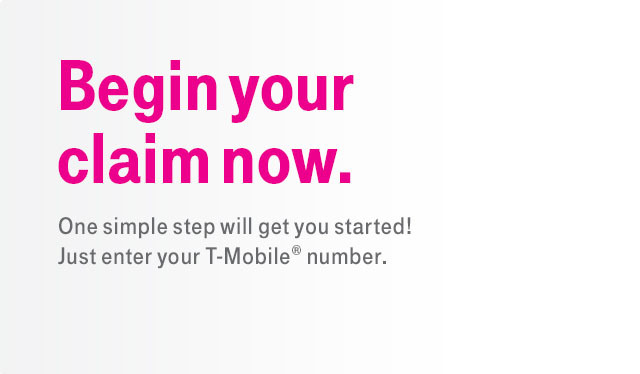 Have your T-Mobile PIN or myT-Mobile.com user ID and password handy. You'll also be asked for contact info of the primary account holder and claimant. * Claim approval may be instant or may take several days depending on the type of claim and timely receipt of all documentation that is required for processing. Holidays may impact shipping times.